Prime Minister Binyamin Netanyahu, Defense Minister Moshe Ya'alon meet with northern commanders - and say IDF will fight terrorism threats. 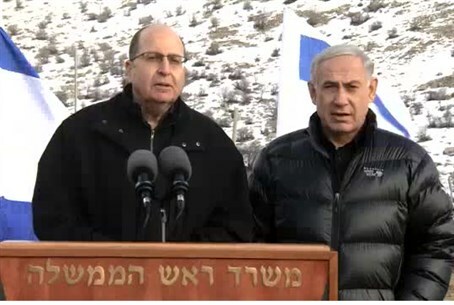 Prime Minister Binyamin Netanyahu and Defense Minister Moshe Ya'alon visited the Hermon Division of the IDF on Wednesday, following last week's antitank missile attack from Hezbollah in the nearby Har Dov area which killed two IDF soldiers. During the visit, Netanyahu and Ya'alon briefed Deputy Chief of Staff Gen. Yair Golan, and Northern Command Chief Major General Aviv Kochavi, and met with mayors from the region. "I came here with the defense minister and army commanders, to see the IDF's preparedness against emerging threats against us in Golan Heights," Netanyahu stated. "For some time, Iran has been trying to open a new front here, this front it has opened against us in addition to others from southern Lebanon and the Gaza Strip." "Instead of leaders in the international community demanding Iran to stop facilitating terrorism in the region and around the world, they rush into an agreement that would allow Iran to arm itself with nuclear weapons," he thundered. "This deal was reached with the Iranian was very dangerous, dangerous for Israel, dangerous to the region, dangerous to the world - and we will oppose it forcefully." Netanyahu also addresses the Islamic State (ISIS) group's horrific execution of Jordanian pilot Maaz al-Kassasbeh, who was burned alive on video. "ISIS burns people alive; the Islamic state of Iran hangs them in the town square," he said. "Both are driven by radical Islam, their cruelty does not know borders - but the greatest threat to humanity would be if this extreme group gains nuclear weapons capability."